MA Architectural Visualisation (MAAV) students returned to Lyon following the successful inaugural trip in 2016. The study tour to Lyon specifically complements two modules; AR822 Virtual Cities and AR846 Architectural Photography. The schedule was designed to take advantage of the rich architecture during the daytime, whilst allowing students to explore the illuminations during the night. The Lumières festival was varied this year, and differed in style and range from the previous year. 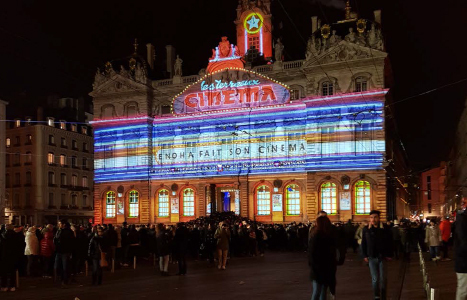 Highlights of the festival included an animation focused on the history of film and cinema in the Place des Terreaux, many of the references to which, the students could understand from their work in AR821 Film & Architecture. 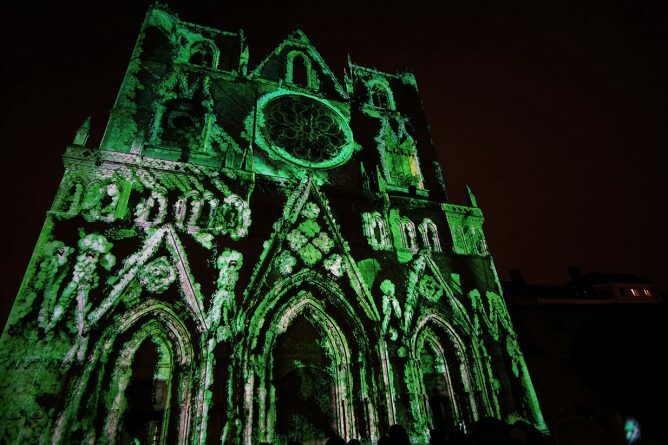 This year, the trip to Lyon was incredibly important, providing an opportunity for the students to see first-hand the ways in which buildings can be animated through projection mapping. The research was directly fed into their own projection work for AR822 Virtual Cities at the recent Cheriton Light Festival in February. This module allows the students to bridge the boundaries between architectures; the actual and the virtual. The quality of their work was, without doubt, aided by the visit to France.